Business to Go. It took Samsung almost three years to upgrade the Galaxy Tab Active. As before, it is water- and dust-resistant and should withstand drops fairly well. LTE and support for stylus input made the predecessor very popular with outdoor fans, and our review reveals that Samsung has only improved the Galaxy Tab Active 2 ever so slightly. Although well-equipped for the great outdoors, the imbalance of performance and price means the Tab Active 2 only holds niche appeal. Older hardware and a high price tag make this a tricky buy for those who aren’t set on using it in the great outdoors. There'll certainly be customers for this, but the specs are lower than most current tablets, while the price isn't. The Galaxy Tab Active2 is clearly not a tablet for everyone. It's aimed at those needing a rugged device that can withstand the elements and a bit of abuse. Consumers and educators in this price range should pick the iPad instead. It's faster, with double the storage, a sharper screen, and better creative software. The Tab Active2's small, relatively low-density screen and lack of space for apps will frustrate consumers who could have gotten a more functional iPad instead. But for your restaurant kitchen or parking patrol, this rugged tablet is just the ticket. Positive: Smart stylus pen; decent display; good hardware; fast fingerprint sensor; face ID. Positive: Very tough; support waterproof and dust avoiding; fast fingerprint sensor; smart stylus pen. It took Samsung almost three years to upgrade the Galaxy Tab Active. 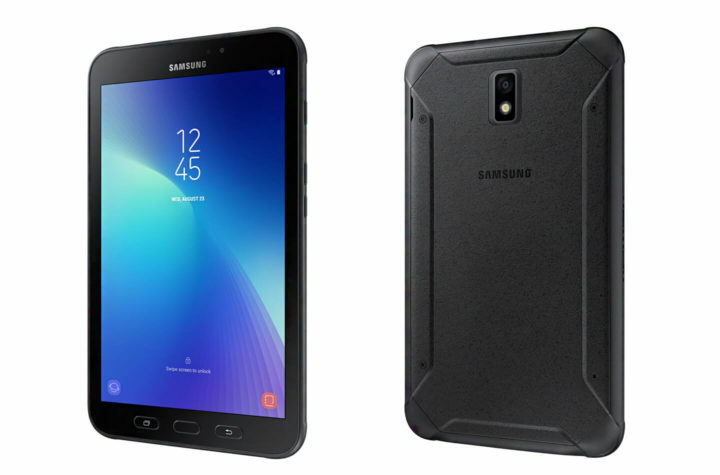 As before, the Samsung Galaxy Tab Active 2 is extremely durable thanks to its MIL-STD-810 certification and should survive severe pressure, temperatures, environments, vibration, and drops. It is also IP68 rated for protection against water as well as dust. Samsung says the tablet is suitable for use in many different industries for various reasons. It could be a great option for those working in construction due to its durable design, while the law enforcement sector might benefit from the many vehicle mounting options that are available. The entire tablet is surrounded by a black metal frame, the battery cover is made of plastic, and the display is covered by Corning Gorilla Glass 3. On the subject of gloves, of course, the Galaxy Tab Active 2 can be used with gloves. The cover also features a slot for the included S Pen. It is pretty tight and requires some force to let go of the stylus. The included cover fits the Galaxy Tab Active 2 very well, and the tablet seems to be very robust and tough. Like most tablets, the Active 2 is equipped with two cameras, a front-facing, and a rear-facing camera. The latter features an 8MP sensor (3264x2448), the overall image quality was fairly decent, even in low-light conditions, with some minor blurriness around the edges and lackluster colors. The 5-MP front-facing camera was even worse. It performed better in low-light conditions than the rear shooter, although its photos turned out even paler, but at least it is more than adequate for video chats. The 8-inch display with a resolution of 1,280 x 800 pixels is mediocre at best, but is not uncommon in the mid-range bracket. That said, the predecessor already featured the exact same resolution three years ago. However, the display is pretty nice overall. Brightness is above average, contrast ratio and color representation are acceptable. Viewing angles are excellent for a TFT LCD panel and there are no distorted colors or inexplicable drops in brightness, regardless of the viewing angle. Outdoor usability was quite good thanks to the display’s high brightness, and the display remained readable even in bright sunlight. Still, given the highly glossy nature of the display’s glass cover, a shady spot would be preferable and much less strenuous for the eyes. 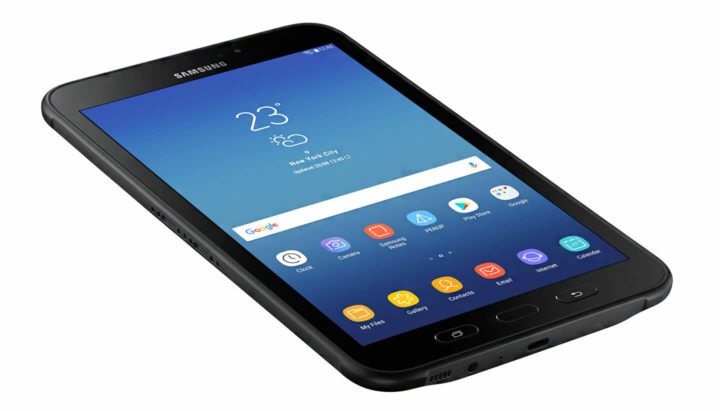 The Galaxy Tab Active 2 is equipped with Samsung’s own Exynos 7 Octa 7870 SoC featuring eight cores, an integrated LTE modem, a dual-channel memory controller, and an ARM Mali T830 MP2 GPU. Despite the fact that this SoC is almost two years old, it is still more than fast enough for most Android apps. 2016 games should also run fairly well on medium details. 75.94%: This rating is not convincing. The laptop is evaluated below average, this is not really a recommendation for purchase.